Parachute produces a case study every quarter, addressing a topic of interest to the Vision Zero community. Cannabis and drug-impaired driving – What’s happening in Canada right now? In July 2018, the federal government of Canada is set to legalize recreational cannabis. This has many road safety organizations, professionals and advocates concerned about an increased risk for drug-impaired driving. This Case Study provides an overview of cannabis-impaired driving in Canada, including a review of current statistics, the unique challenges for preventing cannabis-impaired driving and what governments are currently doing to address this issue. Do Collision Avoidance System Make our Roads Safer? This Case Study goes into detail about the implementation of technology into cars and the effect that has on collision rates. It analyzes four collision avoidance systems: lane departure warnings, forward collision warning and braking, advanced forward lighting, and blind spot detection. The analysis discusses the safety benefits and risks of each system, the limitations of current research and the future of technology in motor vehicles. This Case Study highlights the importance of this issue by providing a behind the scenes look into how traffic safety departments in Toronto and Edmonton are using data to inform their approach to Vision Zero. 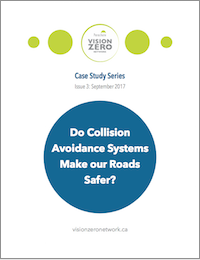 This Case Study reviews the progress of Vision Zero in Canada by providing a ‘snapshot’ of current road safety initiatives within six cities and one province currently implementing or considering a Vision Zero approach.